Motoko Hunt, president of AJPR, agreed, adding that the interests, tastes, and preferences of your audience can change more quickly than you think. Tomorrow’s high-ranking website is all about the audience, said Julia McCoy, CEO of Express Writers. “If your site enhances your audience’s journey, you’ll be rewarded by Google and your visitor will invest in you,” McCoy said. This is especially important because rankings have been fluctuating over the past year to help fit the semantic intent of a user’s search query, said Jesse McDonald, SEO specialist and director of operations for TopHatRank.com. “It will be more critical than ever for SEOs and content specialists to focus heavily on the user intent of the keywords they are targeting while creating content,” McDonald said. Casie Gillette, senior director of digital marketing at KoMarketing, has also noticed Google’s shift in keyword intent. To adjust to this shift in 2019, you may have to change the way you’ve been doing your keyword research, said Chuck Price, founder of Measurable SEO. 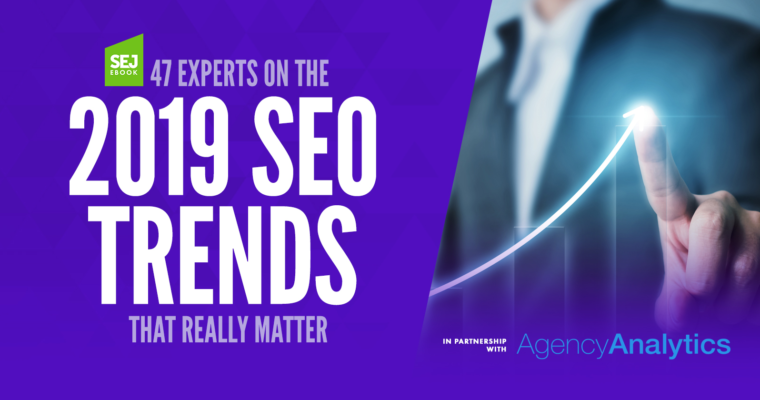 “I think that 2019 will be the year that, once again, SEO will not just be about how to optimize for Google, but we will have to take into account these other ‘engines’ as well,” Schwartz said. As Cindy Krum, CEO of MobileMoxie, pointed out, SEO is about showing up wherever and however people are searching – not just getting the first blue link. So you must learn how to drive traffic and engagement for things other than just websites. Jes Scholz, international digital director for Ringier AG, said she also sees the scope of SEO expanding to cover visibility on other platforms. In 2019, you also must at least consider optimizing for devices, said Kristine Schachinger, digital strategist and SEO consultant. “For those with products that can be sold or brands that can benefit from the exposure, being optimized for home assistant or audio-only devices can’t be ignored,” Schachinger said. Use structured data whenever possible, said Marcus Tandler, co-founder and managing director of Ryte. JP Sherman, enterprise search and findability expert at Red Hat, said you should start looking at and understanding structured data, schema, active and passive search behaviors, and how they can connect to behaviors that signal intent so that the behavior of search becomes a much larger effort of findability. Enge said he expects to see the trend of Google rewarding sites that provide the best in-depth experiences continuing in 2019. “Google was continually tuning their algorithms in this area throughout the year, and I believe there is still a lot more tuning for them to do,” Enge added. That means if you’re still creating content just to keep your blog alive, that won’t be good enough any longer, said Alexandra Tachalova, digital marketing consultant. Shelley Walsh, director of ShellShock, expects to see the level of content quality rise in 2019. Establishing and growing your expertise, authority, and trustworthiness – better known as E-A-T in Google’s search quality rating guidelines – will be another key trend in 2019. Grant Simmons, VP of search marketing at Homes.com, said you should look at content distribution and promotion from a reputation standpoint. Like Google, Bing also wants to reward E-A-T.
On-page optimization will continue to be important in 2019, said Tony Wright, CEO and founder of WrightIMC. Content that answers common user questions. Ensuring internal site search is providing relevant results. Ensure that repeat customers can restock commonly purchased items simply. Customer support responds to questions related to the business. Users are easily able to navigate to physical locations. Providing users with their stage in fulfillment funnel (think: clear, visual process forms). Last decade, “the year of mobile” became a kind of running joke. Every year, the experts predicted that this, finally, would be the year of mobile. Year after year. Until hype finally matched reality around 2015. Well, is this year the year of voice search? Once again, not quite. All that said, Michael Bonfils, managing director of SEM International, said voice search is a game changer for multinational and multilingual websites. “Hopefully, marketers will realize in 2019 that the effective use of voice response can’t be done by translators (machine or human). The use of voice is, and can be, very different from country to country, region to region, dialect to dialect, social class to social class, etc.,” Bonfils said. Dave Davies, CEO of Beanstalk Internet Marketing, said machine learning is about to explode in 2019. But machine learning won’t just be something to watch on Google and the search engines, said Jenn Mathews of Jenn Mathews Consulting.